GLASS CRATER, Wall Street, Thursday (NNN) — The former Federal Reserve chairman, Alan Greenspan, has conceded that the global financial crisis has exposed a “mistake” in the free market ideology which guided his 18-year stewardship of US monetary policy. The US treasury secretary, Henry Paulson, admitted he ought to have anticipated a meltdown in the US mortgage industry, considering he was working at a company furiously pushing sub-prime mortgages. “I’m not saying I would have done anything differently,” he added, leaving people wondering quite what his point was. 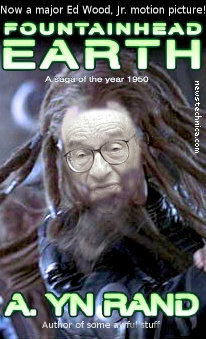 “I’m very troubled by all this,” said Greenspan. “I’ll have to go back and reread Fountainhead Earth until the doubt calms. I don’t understand where Ayn Rand led me astray. This is exactly the sort of nonsense that caused the collapse. Remember kids, every time you say “I don’t believe in capaitalism” a banker dies. I don’t believe in capaitalism, I don’t believe in capaitalism, I don’t believe in capaitalism, I don’t believe in capaitalism, I don’t believe in capaitalism, I don’t believe in capaitalism, I don’t believe in capaitalism.